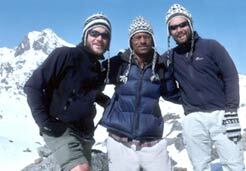 Thomas and Pascal - BOUNDLESS HIMALAYAS TREKKING & EXPEDITION (P.) LTD. Thank you very much for the great time we had during our 5 weeks of incredible trekking in Nepal . We enjoyed the enclosure to Nepali Culture on the Tamang Heritage Trail in the Gosain Kunda & Ganesh Himal Area. It was great to sit in a local home in the kitchen and to drink Raksi and see how our dinner is getting prepared. Also the rafting & safari was a great experience and we are looking forward to our next time in Nepal . Our Guide Gokul was much more than our guide and we really enjoyed the time with him in the mountains. He was a perfect planner but also let us do our own decisions. Thank you very much being so uncomplicated with you we could easily finish our dream around Annapurna & to ABC in even one day less so we could enjoy & relax in Pokhara one more night. We already look forward to win in Dhumbal, Rummy, Callbreak & Wizard, when we come back again. We definitely recommend this Travel Agency & Gokul as the perfect guide.